We love to hear from people. Send us a message if you would like to schedule an appointment or provide feedback about your recent experience. Depending on location and what services you would like, our rates start at just $30 for a 30-minute massage. Do you have an EVENT that you would like MERCI Massage to be a part of? Contact us below to book us! We look forward to hearing from you and remember your muscles will say thank you! I have been a client of MERCI Massage since 2014. Krzysztof literally saved my life! I had completely given up on my health, my muscles were “frozen” inside my body. Krzysztof got me moving again and my muscles working, he gave me knowledge about how to heal. I started with massage, was able to start going to the gym and now I do Pilates 4x a week and am feeling better than I did when I was 30. Forever Grateful to Krzysztof and MERCI Massage for getting me back on track enjoying life! I came to MERCI Massage based on several recommendations when I was unable to get relief from a huge knot in my shoulder. Miss Crystal listened to what I was feeling and started me with a relaxation massage and extra attention to the affected area. I returned the next week and Miss Crystal was able to work all of my muscles more and continue to give my shoulder additional attention. By the third visit, the knot could hardly be felt. I intend to continue with monthly massages…and now wonder why I waited so long. Merci beaucoup MERCI Massage and Miss Crystal! MERCI Massage helped me with chronic back problems. Stacey does an excellent job helping keep these problems from recurring. MERCI is top-notch, very well run and professional. I will be having my 40th massage in April at MERCI !! MERCI has been my “go to” relaxation spot since August of 2014. Josie has been my massage therapist since March of 2016. I could not ask for a better therapist as I believe she has “magic hands”. Not only is my therapist a gem, I could not ask for better customer service from Krista (office). Both Josie and Krista are always professional and kind. I am one very satisfied client !! As a former massage therapist, I enjoy receiving a massage. My 15 plus years, I taught, worked with the United States Olympic Committee, and provided service to a National Football Team. Having served my clients and received many massages from students and National Certified Therapists, I find MERCI Massage very professional, and able to address my needs in a clean, safe environment. Thank you very much. I started going to MERCI last year after my physical therapy ended on my shoulder. I was still feeling discomfort. After one visit with Maria (“Magic Hands”), no more shoulder pain! Maria is AWESOME!! I’ve been going once a month for almost a year now. After my massage, I feel like I’m floating on a cloud! And I sleep like a rock after. I highly recommend that EVERYONE take the time to get a massage. It’s worth every penny. Your health should be your #1 priority. You have to take care of yourself, nobody else is going to do it for you. Keep up the awesome and outstanding customer service! Krista and the staff at MERCI are so happy and friendly. It’s contagious! Call today!! Mention my name and I get 10 extra minutes on my next massage! I met Madeleine in the Redford Chamber of Commerce and started getting weekly massage shortly after she opened. It’s the best part of my week! I see Krys for deep tissue massage. Now that I’m retired & work out 4-6 times a weeks I’ve grown to count on his expertise. “It hurts so good” & he even gives me tips on diet & exercise. Every massage at MERCI Massage is personalized to fit your needs. 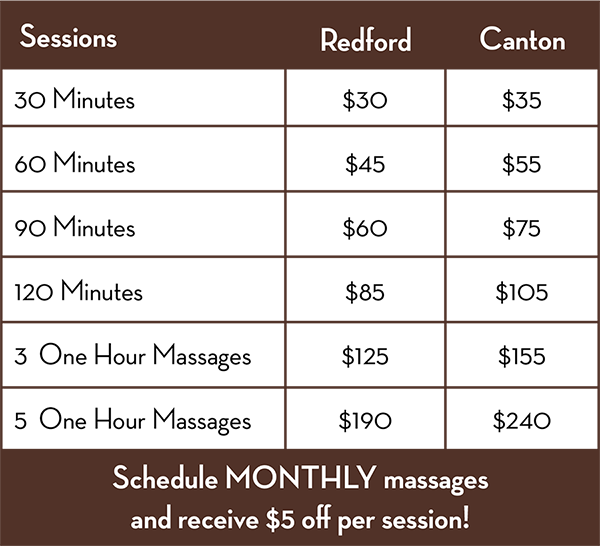 At your first session with MERCI Massage, you will fill out a client history form. Next, your therapist will sit with you and discuss what your goals are. Then you will discuss options for how to proceed and your therapist will incorporate multiple techniques into your session to fit your goals. Afterwards, every session will begin with a chat with your therapist to see which techniques could be adjusted. Therefore you will always have the massage that fits you. MERCI Massage has a variety of techniques that can help you feel the best you ever have. Located inside PRIZM Medical Pain Specialists.